The objects within the System.Reflection namespace of the .NET Framework provide us a means to get assembly and type information at runtime. Reflection is useful in situations where you need to introspect assemblies and their types, either to gain information or to make use of their functionality dynamically without knowing its specifics in advance. Sounds pretty cool, right? Well it is! This article will walk you through the basics of Reflection and the Assembly class and will be followed by additional articles that dive much more deeply into the objects within the System.Reflection namespace. The Assembly class is the primary class within the System.Reflection namespace. This will be our starting point as we take a look at Reflection. 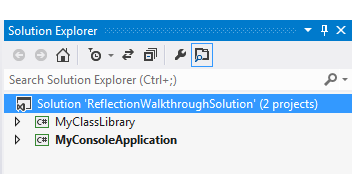 First, we will create a simple Visual Studio solution that we will call ‘ReflectionWalkthroughSolution’. In this solution, we will add a C# Class Library project which we will call ‘MyClassLibrary’. Next, we will add a Console Application which we will call ‘MyConsoleApplication’. These names are nonsensical, but this solution is merely for demonstration purposes :). MyConsoleApplication is bolded because I have set it as the startup project. This will allow us to hit F5 to debug the app and be able to use the console application as our entry point. Next, expand MyConsoleApplication and Add a Reference to the MyClassLibrary project. Once this is done we are ready to start writing a little code. The first thing we will look at is how to get a reference to the assembly that is currently executing. To do this we will add some simple code in the Main() method of our console application as shown below. After writing this code, place a breakpoint on the line, then hover the thisAssembly object and take a look at the properties of the assembly and their values. With the code running, when the breakpoint is hit, we can right-click and Add a Watch to the thisAssembly object. When we hit F10 to step over the line, the Watch window is populated with information pertaining to the ‘thisAssembly’ object. See the illustration below. Hint: Click the image to view it full-size. Let’s discuss some of the properties that are shown in the Watch window above. The CodeBase property returns the full path at which the assembly resides. In other words, the execution location for the assembly, including the name of the assembly.dll file itself. The CustomAttributes property is an IEnumerable<CustomAttributeData> type that displays all of the custom attributes that exist at the assembly level. If you take a look you will see that many of these come directly from the AssemblyInfo.cs file that is found under the Properties folder of the project. We will dive into custom attributes in a later post. Attributes can be applied to assemblies, classes, properties, methods, and more and through Reflection can be retrieved and read using the appropriate objects. These attributes exist at the assembly level. For now, just be aware that these attributes can be retrieved in this way. The DefinedTypes property is an IEnumerable<TypeInfo> type that displays all of the types (classes) defined within the assembly. In our simple little console application we only have one defined type. See below. Looking ahead to later posts, once you have a reference to an Assembly, knowing the types defined in the assembly allow you to dive into the assembly and then into each type as needed. The FullName property is a string value that displays the full name of the assembly. This is important when discussing a topic such as strong naming. There are other properties of the Assembly object that are noteworthy for this introduction. They are the GlobalAssemblyCache property which tells you whether or not the assembly is GAC’ed, the ImageRuntimeVersion which tells you the full version of the .NET Framework against which the assembly is compiled, and the MainfestModule which gives specific information about the assembly itself. Now that we’ve taken a quick look at the properties of an Assembly and how to get a reference to the currently executing assembly, let’s branch out a little and retrieve all of the assemblies referenced and loaded into the current AppDomain. An AppDomain is an isolated environment in which an application executes. The AppDomain class belongs to the System namespace. To retrieve the AppDomain for the currently executing application, we will the AppDomain.Current property. Pretty simple, right? Now let’s dig into the Assembly a little deeper. In our console application, there is only one type, the Program class. When we execute the code above we see information for that single type. Now that we’ve moved down a level and looked at Types within an assembly, let’s move down one more level. The next post discusses the System.Reflection.Type class and its properties and methods. This entry was posted in Reflection, Uncategorized and tagged .NET, .NET Reflection, AppDomain, AppDomain.Current, Assembly, Assembly.GetExecutingAssembly(), Assembly.GetTypes, C#, GetAssemblies, System.Reflection.